Poi Kalon in Bukhara, Uzbekistan. 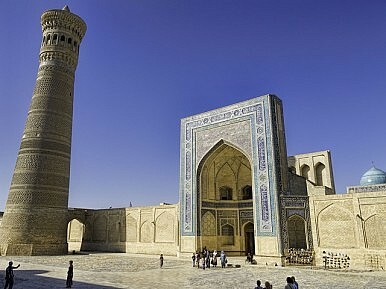 Every Central Asian state has serious issues with freedom of religion, US advisory body says. Over half of the 33 countries that appear in the U.S. Commission on International Religious Freedom (USCIRF) 2015 report, released yesterday, are in Asia writ-large (meaning, countries we cover here at The Diplomat). All five Central Asian states make an appearance. This should come as no surprise to Crossroads Asia readers. USCIRF was created by the U.S. Congress in 1998 with the passage of the International Religious Freedom Act (IRFA). The commission is an independent, bipartisan, federal body which monitors the status of freedom of religion abroad in order to make policy recommendations to the President, Secretary of State, and Congress. In this year’s report, the commission assessed freedom of religion in 33 countries and recommended that the Department of State add eight more nations to its list of “countries of particular concern,” or CPCs, as well as redesignate nine countries to the list. The report also assessed 10 countries which it recommends be placed on the Tier 2 list and highlights six more that should be the focus of concern, but don’t quite cross the threshold to be designated either Tier 1 or Tier 2 CPCs. The Tier 2 category applies to those states in which violations may be serious, and fall into one of the categories outlined above, but do not meet the benchmark of the worst violators. Being designated a CPC does not necessarily lead to policy restriction. The IRFA provides a range of consequences for countries designated as the worst violators of religious freedom. The law requires the President, through the Secretary of State, to make CPC designations and take action–but the variety of actions possible range from “negotiating a bilateral agreement, to imposing sanctions, to taking a “commensurate action,” to issuing a waiver.” None are automatically imposed. So where does the Central Asian states fall on the commission’s report? Turkmenistan and Uzbekistan, already designated as CPCs, are recommended for continued CPC status. Turkmenistan also has an indefinite waiver, and as is the case for Uzbekistan, the waiver is because of an “important national interest of the United States.” While Turkmenistan is neutral, and largely keeps to itself, it has allowed U.S. military overflights of its territory in support of the war in Afghanistan. Both countries are considered vital to the northern distribution network (NDN) which was developed as an additional route in and out of Afghanistan, an alternative to Pakistan. Kazakhstan garnered a Tier 2 recommendation again (it has been recommended to Tier 2 since 2013) and Kyrgyzstan was included in the “other countries monitored” category–countries that are of concern, but do not meet the threshold to be designated as either Tier 1 or 2. By and large the commission’s complaints about the status of freedom of religion in Central Asia relate directly to restrictive laws in the five countries. In Turkmenistan “police raids and harassment of registered and unregistered religious groups continued;” in Uzbekistan the government imposes “a highly restrictive religion law” and “severe restrictions on all independent religious activity;” and in Tajikistan “the government also imprisons individuals on unproven criminal allegations linked to Islamic religious activity and affiliation.” Kazakhstan, although its government promotes religious tolerance internationally, has “onerous registration requirements [that] have led to a sharp drop in the number of registered religious groups, both Muslim and Protestant.” And Kyrgyzstan, which began restricting religious activities with a law 2008, is considering new amendments that “would sharply increase SCRA [the State Committee for Religious Affairs] authority; privilege Islam and the Russian Orthodox Church, and define other religious groups as “non-traditional” among other disconcerting developments. Religious groups throughout the region must be registered and approved by governmental bodies, those that continue their activities unregistered are subject to harsh treatment, their leaders often labeled extremists without regard for what they may actually be preaching to their underground flocks. While the USCIRF’s report and activities are advisory only, and do not mandate any U.S. government actions in response, the report demonstrates that not every arm of the U.S. government approves of the country’s overall strategy in the region.